The two tunnels leading to RPC-073. The picture was taken from the North Section of OL-Site-73. Hazard Types: Bio-hazard, Aggression Hazard, Extra-dimensional Hazard. Containment Protocols: OL-Site-73 has been set up around RPC-073 and consists of two sections; North Section and South Section. Both sections are located 200m away from the northern and southern exits of the tunnels respectively. As of 17/01/19██, all regular trains route through an alternate set of tunnels. All tunnels and maintenance shafts leading to RPC-073 have been sealed off from the public under the guise of ongoing engineering works. OL-Site-73 will maintain a fleet of eight trains each consisting of one specially modified automated driver cabin at the front, two standard passenger cabins in the middle, and another modified driver cabin at the rear. Authority staff must send one unmanned train through both the northbound and the southbound tunnels towards RPC-073 every six hours, regardless of whether a previously dispatched train has exited RPC-073 or not. Failure to dispatch trains every six hours is to be considered a breach of containment and will trigger automatic lockdown fail-safes in both sections of OL-Site-73. Lockdown will persist until a train is sent into RPC-073 from both sides simultaneously. Any instances of RPC-073-1 should be avoided at all costs as direct physical contact results in an extremely fast onset of Bubonic plague symptoms and death within 5 - 15 seconds, regardless of vaccinations. There are currently no known means by which to defend against or repel instances of RPC-073-1. Any unauthorised persons attempting to enter OL-Site-73 or any tunnel leading to RPC-073 are to be apprehended and interrogated. Description: RPC-073 is a set of anomalous underground train tunnels below London, United Kingdom. 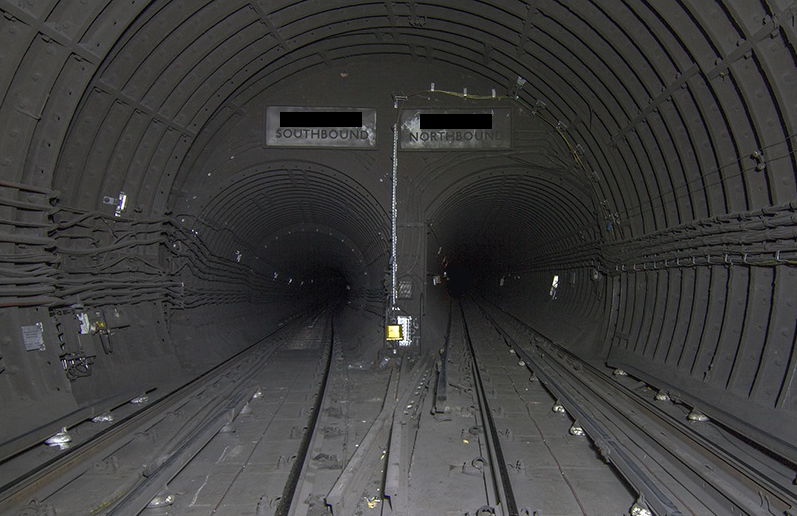 The tunnels are located between the █████ ████ and ██████ ██████ London underground train stations on the ████████ Line. The RPC-073 tunnels show no structural or design differences to standard tunnels; One tunnel is designed for northbound travel, while the second tunnel is designed for southbound travel. Subjects on a train that passes through RPC-073 report hearing abnormal screeching, screaming, wailing, and similar sounds. Subjects also report catching glimpses of black silhouettes in all reflective surfaces within the train. These silhouettes have been designated RPC-073-1. The glimpses and sounds are extremely unsettling for anyone witnessing them and instil feelings of dread and anxiety that increase in intensity the longer the subject stays within RPC-073. Subjects also report feelings of being watched by the RPC-073-1 instances. There are no reports of RPC-073-1 instances causing any physical harm to subjects aboard a moving train passing through RPC-073. However, instances are to be considered extremely hazardous and all physical contact is to be avoided at all costs. Post-mortem autopsies on subjects that had direct physical contact with RPC-073-1 instances indicate that subjects were infected with an extremely fast acting strain of the Bubonic plague.3 According to eyewitnesses and CCTV footage, victims died from the infection within 5 - 15 seconds after contact with an RPC-073-1 instance. Discovery: RPC-073 was discovered on 04/12/19██ when the 8:45 train from ███████████ ███████ to ███████ failed to arrive at the ██████ ██████ station until 4 hours and 23 minutes later. The driver jumped out of his cabin before the train had fully stopped causing emergency fail-safes to activate. The train came to a halt with only 4 of its 6 cabins at the platform. Station staff were overwhelmed by severely distressed, dehydrated, and lightly injured passengers fleeing the train in terror. Authority agents embedded within emergency services swiftly contained the situation and administered medical attention and amnestics to all station staff and passengers. No loss of life was reported, however the train driver fled the scene before containment could be established. The train driver has not been located and, while it is unlikely he will cause any kind of breach of secrecy or lead any unauthorised persons to attempt to breach containment, he has been designated PoI-073-001. He must be apprehended and interrogated as soon as possible. Procedure: Send a well-supplied research team equipped with high powered radios and recording equipment on a train northbound through RPC-073. Result: The train took approximately 3 hours and 12 minutes to reach the other side of RPC-073. On-board sensors indicate the train was travelling at an average speed of 72.4kph, thus travelled approximately 232km. No radio contact could be made for the duration of the experiment due to extreme interference. The cause and source of the interference is unknown, as there is no 'dead-zone' above the tunnels that would be expected if there were some kind of jamming signal or device. All members of the research team reported hearing extremely abnormal screeching and wailing noises, however all research staff report that the source of the noises was 'inside their head'. All research staff also report seeing the black silhouettes designated RPC-073-1 throughout the entire journey on all reflective surfaces, including camera lenses and even on laminated lanyards and polished leather footwear. Captured video footage and photographs show no signs of any reported RPC-073-1 instances, however audio recordings do pick up the reported screaming and wailing but are unable to pinpoint the source. All members of the research team were sent to the psychological department of Site ██ due to severe mental trauma. No malfunctions or abnormalities were found in the communication or recording equipment. Procedure: Send a train fitted with optical, audio, thermal, radiation, sonar, laser, and █████ sensors southbound through RPC-073. Result: Train took approximately 5 hours and 36 minutes. The train travelled at an average speed of 98kph, thus travelled approximately 550km. As before, all standard video footage showed no signs of any RPC-073-1 instances, however this time audio recordings did not pick up any anomalous noises. Only the EM spectrum sensors registered any interference, however all footage resembled white noise. Date & Time: 03/04/19██, 4:05 PM. <16:06> Screeching and howling is heard coming from both the north and south tunnel exits of RPC-073. <16:09> Site Overseer for OL-Site-73 activates emergency lockdown procedures as a precaution. Armed ASF take up defensive positions around the north and south exits as the screams steadily increase in volume. <16:26> The howls reach a cacophony and a small number of fully formed humanoid silhouettes (RPC-073-1) begin walking out of the darkness of the tunnels towards both north and south ASF positions. <16:28> ASF members at both the north and south exits attempt to communicate with the RPC-073-1 instances, but have no success. <16:29> More and more RPC-073-1 pour out of the darkness causing members of both north and south ASF teams to panic and open fire. <16:30> Standard firearms have no effect. Bullets harmlessly pass through the RPC-073-1s as if being fired at shadows, which causes morale to break. ASF members start to abandon their positions. <16:43> Both trains enter the tunnels. All RPC-073-1 instances immediately cease movement and begin slowly fading away. The cacophony of noises begins to slowly decrease in volume. <16:52> All anomalous activity ceases. Conclusion: ██ ASF and ██ research staff confirmed KIA. Both sections of OL-Site-73 were temporarily quarantined. HAZMAT clean-up crews requested additional counselling after the quarantine was lifted. Containment procedures updated to have regularly scheduled trains traverse RPC-073 and to warn of the dangers of interacting with RPC-073-1 instances. The two trains sent into RPC-073 during the incident have not exited the other side. Procedure: Send an unmanned drone into RPC-073 in an attempt to locate the source of the EM interference. Result: Drone was sent into the northbound tunnel, and exited the other side 9 minutes and 40 seconds later. Drone travelled at an average of 16kph, thus only traversed 2.6km. EM spectrum footage shows zero interference for the first 2 minutes, a huge spike that overloads the sensors and stays constant for the next 5 minutes, then abruptly dissipates as the drone nears the exit of the tunnel on the other side. Small splinters of human bone were found in the treads of the drone's wheels. Tests indicate these shards date back to the 14th century and show signs of Bubonic plague infection. 1. This RPC must be linked to the 14th century Black Plague outbreaks somehow. The bone fragments are highly likely to have come from one of the many mass graves used during said outbreaks. There are multiple recorded cases of long forgotten mass graves being breached and unearthed during the London Underground tunnel network construction and various expansion projects over the years. Procedure: Send a heavily stripped down driver carriage (Just drive train and auto control mechanisms, no hull, seats, or additional carriages) into the northbound and southbound tunnels through RPC-073 at the same time, with both trains set to travel at 32kph. Repeat experiment after both trains have exited RPC-073. Northbound train took 2 hours and 9 minutes to exit. Recorded distance travelled was 70km. Southbound train took 6 hours and 33 minutes to exit. Recorded distance travelled was 210 km. Northbound train took 5 hours and 12 minutes to exit. Recorded distance travelled was 167.5km. Southbound train took 47 minutes to exit. Recorded distance travelled was 25km. - One female Canine (Dog) of the Labrador breed. - Two male, and one female Rattus Rattus (Black Rat). - Two male Columbidae (Pigeon). - One female Pan (Chimpanzee). Animals were loaded into separate carriages and locked in cages large enough for them to freely move around in, but not be able to sit on any seats or have direct contact with the doors, windows, or ceilings of the carriages. Extra cameras were installed in each carriage. Result: Aside from expected distress of being in an unfamiliar environment, the animals were not harmed nor showed any signs of being exposed to RPC-073-1s. Video recordings verified that the animals were not reacting to anything out of the ordinary. Audio recordings also did not pick up any anomalous noises. Procedure: Send four D class personnel with enough supplies to last 12 hours on a northbound automated train programmed to go 50mph for 20 minutes, come to a complete stop, wait 10 minutes, then return to speed until exiting RPC-073. The doors of the train were not programmed to open until the train exited RPC-073 and arrived at the South Section platform. Each D class is to be put into their own separate carriage, and windows of each carriage welded shut. D class were not informed of the specifics of the test. Result: Train took 1 hour and 14 minutes to exit RPC-073. Recorded distance travelled was 86km. All D class personnel were found dead inside their cabins and all showed the same symptoms of Bubonic plague as the victims of Incident 01. Video footage shows all D class frantically attempting to get away from unseen assailants, before the quick onset of plague symptoms and death. Procedure: Send two teams of two D class personnel equipped with high powered lighting devices, gas masks, digital cameras, survival gear, and enough batteries and rations to last a week northbound and southbound into the same RPC-073 tunnel. All D class are to be administered all currently known vaccines for the plague. Teams are to be instructed to watch for scheduled trains and to take cover in tunnel recesses when necessary. Both teams are to regularly document and record any findings. The teams are to be instructed to pass each other halfway through the tunnel and to continue until they reach the far end. Result: Video footage of the tunnel entrances show both D class teams enter the tunnels proper. Direct visual contact is lost as they walk around a curve in the tunnel. Light from their torches fades until there is no trace of the teams. Eleven days elapse before staff end the experiment. All four D class are considered MIA. 1. The longest recorded time for a train to fully traverse RPC-073 is currently 34 hours and 17 minutes, despite travelling at an average speed of 88.5kph. 2. Speed = Distance ÷ Time, Time = Distance ÷ Speed, and Distance = Speed × Time. 3. Also known as 'The Black Death' that wiped out an estimated 50 million people across Europe during the 14th century.